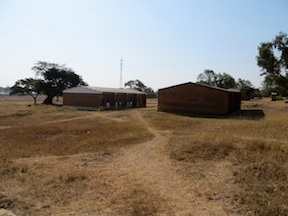 (Left) A view of the Mtenthera Community Day Secondary School Buildings from the outside. These buildings have no running water, no electricity, and no furniture. 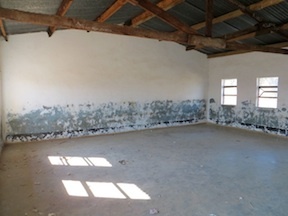 (Right) The inside of the classrooms at Mtenthera Community Day Secondary School. While there is no furniture in the classrooms, at least there is a roof to protect the building and the students during the rainy season. 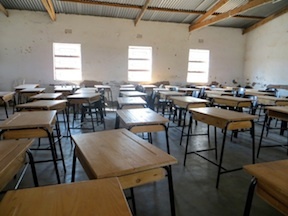 (Below) This is the single (only) classroom at Mtenthera Community Day Secondary School that has desks.